At age 97, Phyllis Markos has had enough life experiences to know when something "just feels right." That kind of fit is exactly how Phyllis describes living in La Crosse, Wis., and her recent decision to invest in Gundersen Medical Foundation. Born in 1920 in Lawrence, Kansas, Phyllis attended the University of Kansas and later moved to California. There she met La Vern Markos, a La Crosse native whose family had relocated to California when he was a boy. The pair married in Las Vegas in 1949 before moving to Missouri where La Vern used his GI Bill to attend college and earn a degree in engineering. Her husband's subsequent career as a mining engineer for the United States Geological Survey (USGS) took them from Missouri to Colorado. Along the way, Phyllis had her own career with the USGS, spending 20 years as a cartographic technician drawing contour maps before she and La Vern both retired in 1981. In 1984, La Vern was diagnosed with a lung disease called eosinophilic granuloma. To better accommodate La Vern's health, the couple moved to Venice, Florida, but also began seeing a specialist, Dr. Lindesmith, at Gundersen Health System in La Crosse. Over the next 17 years, the Floridians spent many happy summers in La Crosse. In addition to excellent medical care, La Vern and Phyllis enjoyed the area's natural beauty. "La Vern loved outdoor activities like fishing and hunting," shares Phyllis, "so we visited often, and in 2005, we moved to La Crosse permanently." La Vern passed away in 2011, and that same year, Phyllis suffered a heart attack. Given the excellent care her husband had received for so many years, Phyllis also turned to Gundersen for her healthcare needs. 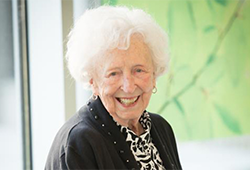 "I was so grateful for the quality of care that both of us received," says Phyllis, who noted the nursing staff in cardiology was "particularly wonderful." This gratitude for their care, along with a desire to support medical research (especially cancer research), led Phyllis to invest in a charitable gift annuity through Gundersen Medical Foundation. "I see this gift as doubly beneficial," she explains. "The money is being used for important causes, while at the same time, I enjoy the tax benefits and interest payments. Plus, I feel good knowing investments in medical research make a difference for all of us." Today, Phyllis particularly enjoys the fellowship she has found at Eagle Crest South Senior Living Community where daily gatherings of friends and residents are rich with stories and laughter. She also enjoys knowing her gift makes an impact on the community she has grown to love and hopes others will be inspired to do the same.